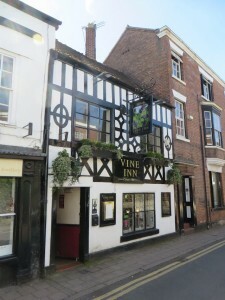 The Vine Inn, in Hospital Street is one of Nantwich’s oldest pubs. It’s in a lovely 17th century building. It’s a two-storey rendered building, with a sham timber frame in addition to the original timber frame. A mirror in the pub suggests that it was opened in 1641. There used to be an outside passageway, which is now part of the pub. There used to be two bars, separated by a courtyard. You can see where this was, there’s now a glass roof. When you go inside the building the floor is lower than street level – I’m not sure why this has come about. A neighbour of the The Vine, George Latham, (who was an architect) complained to the Local Board about a Mr Wright at The Vine, who was keeping a pig. He was concerned about immediacy to the potential porcine scent. However a special sub-committee of the Local Board paid a visit and considered the pig to be so cleanly kept that no nuisance had occurred! In 1903 the inn belonged to Lassell and Sharman, the brewers from Caergwrle, North Wales. Lassell and Sharman got taken over by Burtonwood in 1945. The pub is currently owned by Hydes Brewery, an independent brewery in Manchester. The Vine normally demotes a place where wine is sold. Wine has been (and still is) sold in this pub, but I’m not aware that this was ever the main drink of choice. Buildings at the back of the property are called Vine Buildings, but I don’t know if they were named after the pub or if the area ever had vines. There have been reports of a ghost, but it’s not been seen. Some say rooms go cold and clammy and objects in the cellar move from original positions. Original outside passageway, which is now part of the pub, is supposed to give a ghostly and cold feeling. Did something happen in the passageway years ago? In the 1851 census a 37 year old schoolmaster, Peter Eaton is shown as a border – suggesting it was a boarding house at that time. Click here to read about an alleged perjury case involving the Vine. There’s one or two gaps, please email me if you have any information or corrections. Thanks Jane, I’ve updated the page. Have you got any old pictures inside the pub? I think everybody know Jane’s dad as Allen. 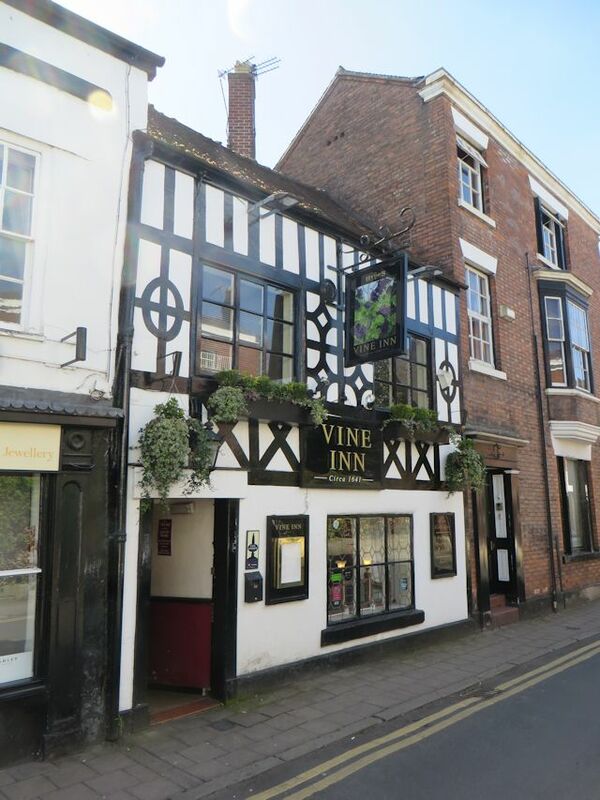 I stayed at the Vine for a month in August 1983 when I first came to work in Cheshire. Pat and Allen – Jane’s Mum and Dad – were a great team and looked after me very well. B&B was £6.75/night (a 10% discount for longer booking from £7.50)! I was then recruited to the Monday Winter Dominoes B Team – having never played fives and threes before in my life, or even heard of it. Great times.